"This whole mountain's ours…" "We own it. Grandfather brought me up on this mountain when I was 14." IFC Films has unveiled the first official trailer for the film Walking Out, a survival thriller set in the snowy Montana mountains. The story is actually about a father and son, and their bond together and how their relationship is tested in a dangerous situation. Matt Bomer stars as the father, and Josh Wiggins as his son, who comes to visit him once a year. He's not very happy about it, but they decide to go out hunting. When something goes wrong, it's up to his son to come to the rescue and does his best to save them. This premiered at the Sundance Film Festival and I caught it there. I wasn't the biggest fan of the film, it's a bit bland and straightforward, but there is a strong emotional core about father-son bonding worth exploring. An estranged father and son are forced to rely on one another to survive an unforgiving wilderness in this riveting, richly emotional thriller. Once a year, fourteen-year-old David (Josh Wiggins) travels from his mother’s home in Texas to visit his loner father, Cal (Matt Bomer), in the remote mountains of Montana. There, the two embark on their annual hunting excursion, during which the taciturn Cal attempts to connect with his phone-addicted son. But when a terrifying turn of events leaves Cal critically wounded, it’s up to David to summon enough strength for both of them. Walking Out is both written and directed by American filmmakers Alex Smith & Andrew J. Smith, of Winter in the Blood and The Slaughter Rule previously. This is adapted from David Quammen's short story. It premiered at the Sundance Film Festival earlier this year. 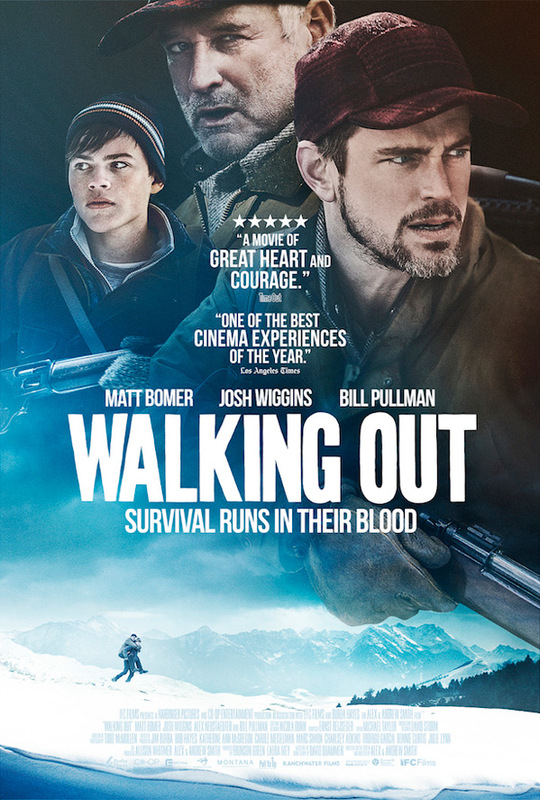 IFC Films will be releasing Walking Out in select theaters + on VOD starting October 6th.